It seems almost everyone thinks that the Tories have this election in the bag. With the latest ComRes poll giving the Tories 50% of all votes, it’s not hard to see why. But perhaps there is good reason for this. Labour leader, Jeremy Corbyn is not just a friend to controversy, he also seems to flirt with very silly ideas. One of many is the idea of a national investment bank, which he says would enable £500 billion worth of investment in infrastructure and industry. This would allegedly create one million new jobs, which might seem like a nice thing until you remember that unemployment in the UK is now hovering around 5% – the best it has been in a long while. 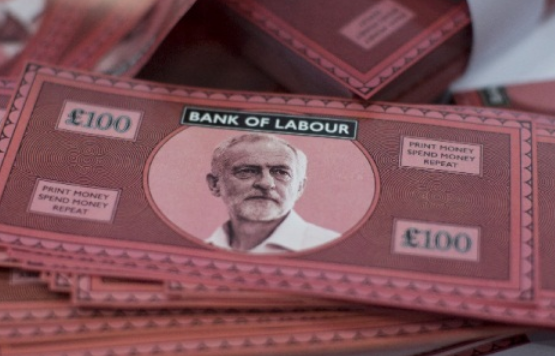 Corbyn’s idea seems even more preposterous when you also consider the current national debt of 1.6 trillion. But the idea of a National investment bank is not just unnecessary, it is foolish. The track record of the idea is really rather shocking. Tony Benn’s similar National Enterprise board in the 70s threw money at all kinds of wacky things. From British Leyland motors, to British leather, money was spent where it would create no wealth. Meanwhile private industries in the tertiary and quaternary sectors grew and those industries that Benn’s National Enterprise Board tried to protect simply fizzled out. There is no reason that a rebranded version of Benn’s failed project would do any better. It would just lavish taxpayer’s money on projects run by those with political connections, creating arbitrary jobs in Labour seats. And even if you concede that the National Investment Bank’s job creation is a good thing, the kind of jobs that it aims to create are not going to help the kind of people who need helping. Gone are the days when building roads required hard unskilled labour. The kind of people who are likely to be employed to build infrastructure nowadays are engineers, operators of technical machinery, and other skilled and educated individuals who are unlikely to be unemployed. A national investment bank has the potential to really hurt private investment too. The enormous amount of borrowed money required to pull it off would mean issuing extra bonds, which in normal times means competing with private firms for investment funds. Private firms would have to pay more to borrow, or re-consider their own investments – meaning less private capital spending on factories, machine tools, training, R&D, and housing. So when the government borrows to fund its own investment, private investment has to fall. Occasionally government investments are worth it, but boondoggles like the Millennium Dome are de rigeur. When even the most switched on venture capitalists find it difficult to pick sound investments, technocrats with no commercial experience are likely to find it impossible. Because of this, the national investment bank is not just unnecessary, but completely unworkable.